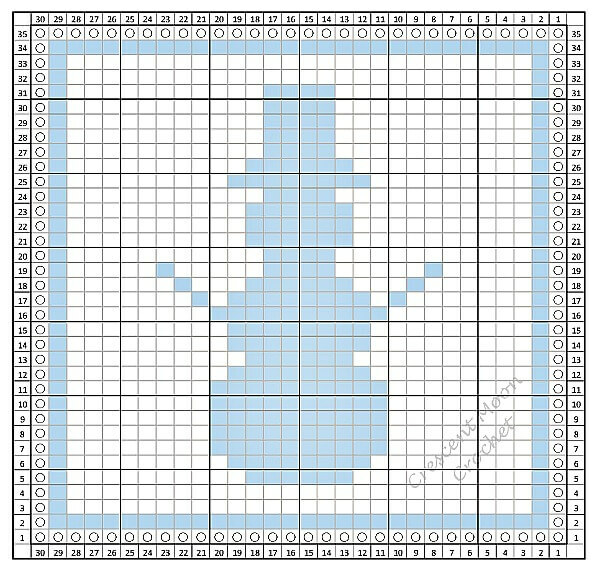 This snowman dishcloth pattern is the January pattern in our series “A Year of Tunisian Crochet Dishcloth Patterns“. To find the full listing of patterns for each month, click here. I have been working furiously trying to learn this Tunision style of crocheting. I am pretty confident that I have all of the stitches down. Just sat down at my computer with my yarn, hook, and glasses, and I have come to a screeching halt. I do not know how to read charts!! I don’t know what the circles mean, or what the white and shaded blocks mean. I searched your blog for written directions, but could not find anything. Help! Hi Sandy 🙂 The white blocks are Tunisian knit stitch and the colored blocks are Tunisian reverse stitch. Here is the full key: Circle = first/last stitch; Color = Trs; White = Tks. Hope that helps! I am left handed. Can I learn this??? I’m left handed, and I can do this, so I would think so! Good luck!! All you would do is read the graph from left to right instead of right to left. Will there be PDFs for this cal?